27, of Holden, Maine; assigned to the 3rd Battalion, 3rd Special Forces Group (Airborne), Fort Bragg, N.C.; died April 3 at the Landstuhl Regional Medical Center, Germany, of wounds sustained while conducting dismounted combat operations in the Zahn Khan District, Afghanistan. 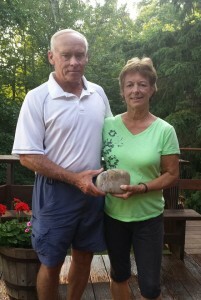 To honor their son, Nick’s parents, David and Nancy Robertson retrieved this stone on Mt Desert Island at the beach. That location was chosen because Nick was an avid rock climber and kept telling his parent’s that he couldn’t wait to get back to Mt. Desert so he could climb again. Nick was a very patient, kind and clever man. He chose to go the enlisted route even though he had multiple degrees because he wanted to work his way up through the ranks. He had initiative. When he saw a need for something he did it. He started many different programs during his time in service, to include opening a gym in Afghanistan. The gym is now named after him. He faced a challenge head on and had a lot of courage. His parents watched the Army transform their son into a man. Each time he came home he stood a little taller, he listened a little more attentively, his shoulders were held back just a little bit further. He would talk to them about little things like how good it felt to feel the snow on his face when he was in Afghanistan because it reminded him of home. They can picture him standing there with his head back and arms out feeling it on his face. Hearing this story is how they learned that it even snowed over there. He loved to write and was passionate about journal. His journals were sent home to them and they were able to read about his life there in his own words. There is nothing more powerful then the written word and he was a passionate writer. 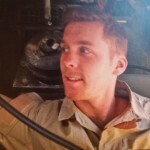 Nick was a good kid and a great brother, soldier and friend. He always remembered to call home and had a special bond with his mother. He was a great blend of both of his parent’s. You can look at him in one picture and see all David, only to turn the page and see Nancy looking back at you. He was a beautiful boy and he is missed. Nick was a very trusted soldier who was great at his job. He did it so well that when asked to help plan a mission with two other soldier. He drew a picture that looked like a little kid did it as he was not an artist. It was of a plane going over a mountain and some other things. It was submitted and headquarters told him to go for it. They were all shocked! He had multiple clearances for someone so young and early in his career. After his passing his father was approached by a high ranking officer who told him he had been looking over Nick’s SRB and he was blown away at all he had done and all the access that he had been given. Nick had more clearance than him. We guessed that in the land of “Need to know” basis, this guy just didn’t need to know as much as he thought he did. Nick was selfless and always thinking of others. 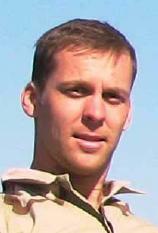 Nick was killed three weeks before he was due to come home on his second deployment. A fellow soldier had a injury earlier and wasn’t feeling well. Nick told him not to worry and volunteered to go in his place. He never made it home. A common question I get asked about TSP is, “Do you form a bond or connection with every stone you carry?” Up until last week, I didn’t know how to answer this because I had only carried one stone. My journey with Nick’s stone was not the standard TSP way. I did not hike with his stone. I did not run in a 5K or any form of marathon. Rather, I spent a week with his stone in my home. It started when I had the honor of picking up Nick’s stone from the engravers and taking it to the 1st Annual Nicholas Robertson Memorial Golf Tournament on Friday July 17, 2015. Having the opportunity to spend time with friends and family of Nicholas is something I will treasure always. The outpouring of love for Nicholas and the rest of the Robertson family was easily seen. It was seen in big gestures like the husband of Nick’s cousin taking on the task of putting together the golf tournament and three of Nick’s teammates flying in to play golf in the tournament. And it was seen in small gestures like when his aunt was telling me some of her memories of Nick and she put her hand on her heart and gave a little sigh. You can tell a lot about a person by the way their friends and family honor and remember them. I loved hearing the story about him buying his car in Florida and driving it to Chicago, the car that his brother Todd drives now. How he had never driven a standard before until he drove his new car off the lot. There were moments too of a mother’s love and deep loss. There is no time limit on grief, especially between a mother and child, and that was never more obvious to me than sitting and talking with you, Nancy. 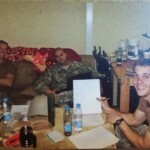 As I sat there listening to you recall a few stories and memories, you held the small keepsake photo album of Nick’s time in Afghanistan given to you by his teammates Tom, Ryan, Rob and JR and my heart broke watching you lovingly cradle that album in one hand and lightly caress it with the other. And, for a moment, you got lost in thought and looked down at the album. I had to turn away and blink back my own tears. I want you to know that that very moment is the reason I stay involved with The Summit Project…to assure you that Nicholas will not be forgotten. So to go back to the question “Do you form a bond or connection with every stone you carry?” For me, the answer would have to be yes. For a week I transported Nick’s stone in my vehicle several times, I carried it in and out of my home, I sat with his stone at my kitchen table while I listened to your interview, I brought it to the memorial golf tournament, I carried it in my backpack while rucking in my neighborhood and I even took a cue from Nick’s idea of making a gym in Afghanistan with the materials he had and used his stone as a weight during my workouts. All three of my kids held Nick’s stone and I told them about him. I sat with Nick’s stone at his gravestone at the cemetery and spoke to him about the similarities we shared. A fellow Gemini with our birthdays just a day apart, both growing up as a middle child between two brothers, our love of reading and writing. We both were in the band in high school…ok so he was much cooler because he played the drums where I played the clarinet, but still, we both received awards for our musical talent. I made the most of having Nick’s stone in my home this past week. And yes, a connection was definitely formed. Toward the end of one workout, I was feeling quite fatigued and out of breath. I only had a few more reps to do and as I lay there on my floor contemplating whether I should just stop or keep going, I turned my head and looked over at Nick’s stone a few inches away. I broke down in tears, pushed myself up and kept going. Remembering Nick’s sacrifice was the push I needed. 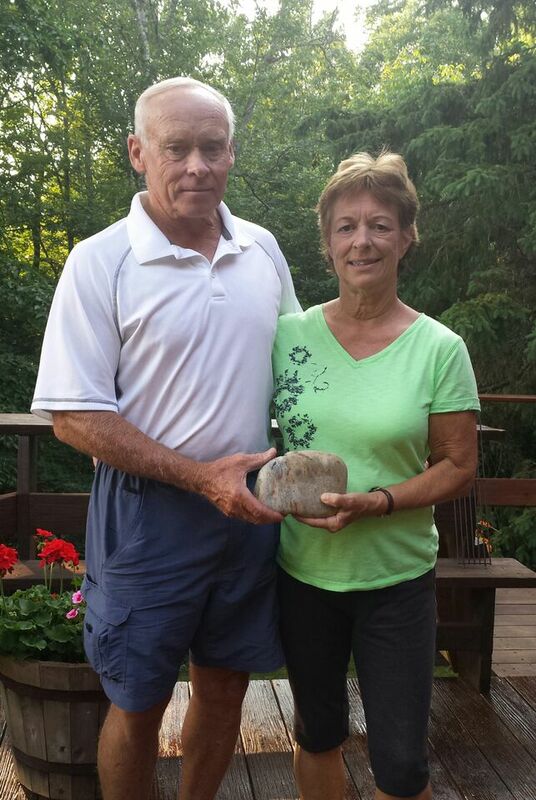 On Friday July, 24th, I drove to MEPS in Portland to drop off Nick’s stone in its new home. I found an empty parking spot in a lot just under a half mile from MEPS. As soon as I put the vehicle in park, the skies opened up and the rain fell. Hesitating for just a split second, I threw on a light raincoat, grabbed Nick’s stone football style with his info facing out and walked to MEPS. Some people gave me strange looks, but I stood a little taller all while making eye contact and smiling to those who I normally would avoid eye contact with. Stepping into the room where all the stones are on display, I was hit with a wave of grief so hard it was like I walked into a wall. I’ve seen all The Summit Project stones at once and have handled many of them at events, but seeing them on the shelves in the dimly lit room was sad and strangely beautiful at the same time. Emotions were high as I slowly placed Nick’s stone on a shelf. And that’s how I know a connection was formed. Because while I knew that his stone needed to be there so that others have the opportunity to carry his stone and learn his story, there’s still a part of one’s self that wants to hold on to his stone and keep it close always. David, just after I took a photo of you and Nancy with Nick’s engraved stone at the tournament, you started to walk away and then turned back and gave me a hug saying “thank you.” It is I who thank you! I promise you David and Nancy, to always remember Nick and to share his story with others, to live a life worthy of his sacrifice. Much like you held the keepsake album Nancy, many times over the week I held Nick’s stone, the curve in the back fitting perfectly in the palm of my hand. My connection to Nick’s stone ensures that Nicholas will NOT be forgotten. On Sunday, August 16th, I had the honor of carrying Sargeant Nicholas Robertson’s TSP memorial stone in the Run For The Fallen. I had planned on participating at the event, but was not planning on carrying a memorial stone. At the TSP table, I found out that they were allowing people to carry the stones. Not knowing any of the soldiers that were represented, I asked Heather Grace Audet to pick a stone for me. She picked Nick’s stone and told me everything she knew about him since she had picked up his stone from the engravers and had spent a week with it before handing it off to MEPS (Maine Entrance Processing Station) in Portland where the stones are kept. She also spent time with the family to learn about Nick and help tell others his story. The format for the RFTF event is unique in that all the fallen servicemen and women have signs along the 5k route. If the family is at the event, they are at the sign. Not knowing if the family was at the event, I got anxious when I starting hitting the “P’s” as I knew Nick’s sign would be coming up soon. When I got to his sign, there were people there, and I asked them if they were Nick’s familly. It was his father and brother. I had a nice short chat with them and a picture opportunity at the sign. I was so glad to have met his family at this event as his parents will be in Florida during the TSP at ANP event in October. After the completion of the event, I returned Nick’s stone back to the TSP table so that others could see it. Later, I met up with Nick’s father and brother, and they told me all about Nick’s life. He was very smart, dedicated and loved his family and his country. His brother told me it was hard losing him as they were very close, but now that he’s had time to reflect on all the good times, he’s glad that his brother’s story is being heard by others and he will not be forgotten. I don’t have a personal connection with Nick, but I feel close to him since I’ve carried his stone and his story. I will never forget that day and will carry him for the rest of my life. I had the honor of taking SGT Nicholas Robertson’s stone on two beautiful sunrise hikes in Maine and New Hampshire on August 31 and September 1, 2015. At 2:30 am on August 31, my friend Cathy Gordon and I hit the trail head at the base of Cadillac Mountain in Acadia National Park, with the goal of summiting in time to watch the sun rise. Cathy carried the stone of SGT Christopher Wilson, whose stone I have hiked previously, and whose grave I have visited at Arlington National Cemetery, not far from where I live in Washington, D.C. I had begun to think of Nicholas and Christopher as the “Brothers” since I picked up their stones in Portland a few days earlier. I placed them in the passenger seat of my rental car as I road-tripped across Maine – my true home. They were my companions on this adventure, and together we crisscrossed the state, visiting friends and family, and honoring Maine’s fallen at memorials and in the homes of Gold Star families who have become dear friends. Cathy and I wore head lamps and reflective gear in preparation for ascending Cadillac in the dark, but a spectacular full moon lit our way and, once we were above the tree line, we no longer needed artificial light, as the moonlight reflecting off the exposed granite and the ocean below guided us to the summit. There are few things as quiet as the Maine woods, especially in the middle of the night and, and as we climbed, I reflected on SGT Robertson’s life. He was a determined young man – not the type to take the easy path to any destination. Despite being qualified to enter the military as an officer, SGT Robertson instead chose to take the enlisted route and work his way up through the ranks. I thought often during my four days with his stone that making this decision was the mark of a true leader – a man who valued being a peer before being a commander. The stone in my pack bearing SGT Robertson’s initials was retrieved from a beach on Mt. Desert Island, not far from where our carefully-placed footsteps brought us closer to where we could look out over the area that he loved so much. During his deployment, Nick told his parents that he couldn’t wait to get back to Mt. Desert so he could rock climb there again, his favorite activity in his favorite spot. I felt honored to carry his stone to that sacred location, to in some way return him back to the place he craved, and to watch the sunrise with his stone over the rocks he couldn’t wait to come home to. The following day I was back in the car with the Brothers on our way to the next adventure. Shortly after finishing up the Cadillac hike, I drove to New Hampshire to meet my high school friend Kristin Stelmok to hike the stones in the White Mountains. We chose a short but steep climb to the summit of South Moat Mountain, again taking off at 2:00 am. And again, the bright moon guided us. Kristin and I had lots to catch up on, and we chatted for most of the ascent. With Christopher’s stone in her pack, she shared with me what she had learned about him, and I learned new things about him that I hadn’t discovered prior to my own hikes with his stone. It struck me that with each person entrusted with a single stone, a little portion of the hero’s life is remembered and retold, but that collectively, we can learn and retell an entire lifetime of memories. I shared Nick’s story with Kristin, who has been my best friend since we were kids growing up in the Dover-Foxcroft area. We both love the outdoors and, while Maine winters can be long and grueling, we love snow and have spent many winter days skiing and snowboarding in Maine and New Hampshire. Kristin listened with rapt attention as I talked about Nick, especially the joy he found in simple things like snow. As we climbed, I pictured him delighting in the first snow of every winter, running outside and throwing his arms wide, tilting his head back, and feeling the cold flakes on his face, just as his family describes him doing. Even if Afghanistan, he loved the snow because it reminded him of home. Later, when we reached the summit of South Moat, and the first rays of sun splashed across the Whites, I also widened my arms in the wind, tilted my head back, and smiled. It felt so good to be home. Kristin, the Brothers and I had the peaceful summit sunrise all to ourselves. Before long, the wind died down and, with the newly-risen sun on our right, and the full moon to our left, we felt reenergized and decided to complete the traverse, summiting Middle Moat and North Moat Mountains before descending. We had the entire ridge to ourselves for the duration of our hike. At the top of each peak we pulled out the stones and sunned ourselves, tilting our heads back, as Nick did, feeling the warmth on our faces. In those moments, I was inspired by Nick’s selflessness and his sense of service-over-self. I hope a little of that spirit rubbed off on me during my adventures with his stone, a four-day road trip with a truly inspiring pair of companions. To SGT Robertson’s family, thank you for sharing the memory of this amazing young man with all of us. I have thought of him every day since returning his tribute stone in Portland. He inspires me to be patient and to delight in the simple things, and I treasure our shared love of home. I hope it brings you some comfort to know that he continues to lead even those he did not know in life. I had the honor of carrying Sgt. Nicholas Robertson’s Stone at the Maniacs 5k Charity event in Bangor on 27 September 2015. Although I had been to other TSP events, this was the first time that I carried the stone of a fallen service member. As I reflected on Nick, I started my focus on how I could relate to him. I believe it is important to relate to them and make a personal connection. As one member of the Maniacs 5K TSP team stated, these were people and not just a stone that we carried and honored. I ran into Heather in Newport late August while at the 5K for Jay. She stated that she was still looking for people to participate in the Maniacs 5k in Bangor. Two of us volunteered that day. I had no idea whose stone I would be carrying that day and found out several days later. I knew Nick’s story prior to his stone picking me. I found myself reflecting on Nick’s story both before and after the Maniacs event. He had so many traits that we can learn from and aspire to incorporate into our own lives. He had initiative and if he saw something that needed to be done, he did it. He was a volunteer and believed in working his way up from the bottom. Some of the most successful and admired leaders have started this way. It is the epitome of the American Dream. Nick was also a passionate writer. I believe that if we all continue to talk, remember and write about the fallen, then we will honor them and their memory will live on. I would like to close by asking others to reflect on Nick’s story and aspire to incorporate just one of his traits into their own lives. There are occasional events or people in life that make such an impact that they change you, forever. And so it happened to me, on the 17th of October, 2015. In my case it was both an event and a person – hiking to the top of Cadillac Mountain in Acadia National Park remembering Sgt. Nicholas A. Robertson. Thinking about who he was, what he sacrificed and why, who loved him – and loves him still, and even who he never got the opportunity to be. My “hike” started considerably before Oct. 17th. It began when I accepted the invitation to participate as a hiker and memory stone carrier with 79 others to honor Maine’s fallen. Prior to that, my exposure to The Summit Project and its mission had created a higher level of awareness and a deep level of respect. And then it got personal. At our Summit Circle, I shared with my hike-mates that I had always been very cynical about artists who say their paintings “told them” what to paint, that their book “wrote itself” – they were just the instrument. So imagine my surprise when Sgt. Robertson’s stone “picked me”. I had already read many of the stories of those we honor, and had in fact been assigned a stone. But when I went back to the TSP website to read about my assigned soldier, I somehow ended up reading about Sgt. Robertson. As I was reading his story, I knew, felt positive, that I was supposed to carry his stone and tell his story and was relieved to find out it was still available. I find that I have thought a lot about Sgt. Robertson as a soldier, about how trusted he was, how selfless. I’ve thought about how his final mission was one that he wasn’t scheduled to be on, but he had stepped in and offered to replace a buddy that wasn’t feeling well. I’ve thought a lot about the environment they were in – what it must have been like, and how much they must have cared about and relied on each other. But I’ve also thought equally as much about Nick – the man outside the uniform; the man who was the son, the brother, the cousin, the student, the friend. I related to both, admired both, but was touched most deeply by thinking about who Nick was. He MUST have had faults – don’t we all? But if he did, they were so outweighed by just how darn cool he was that they didn’t matter. Here was a guy who appreciated the power and privilege of the written word; who chose to major in Philosophy and minor in both French and Classical Studies in college; who was close with his family…especially close to his Mom. And who was physical, rock climbing at home and opening a gym that is now named after him in Afghanistan . He was a man who chose to enlist and earn his way up in rank rather than accept the officer position his education afforded him. I imagine him to be sensitive, more quiet than not, and complex. I have a daughter who is the same age Nick was when he died, and I do mourn the man he didn’t get the chance to become…perhaps a husband, father, president of the United States? But I am comforted by the certainty of how much he accomplished and how many he touched in his 27 years as well as by how many he will continue to touch by those who remember him, who speak his name, who carry his stone and story, who learn about him through The Summit Project and from those who shared life with him, who smile when thinking of him, and yes, who grieve for him. I am amongst those – forever. Thank you, Mr. and Mrs. Robertson, for the gift of your son in my life. Maine Hero, Sgt. Nicholas A. Robertson, will never be forgotten. 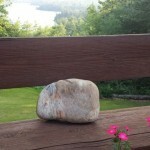 “We had the honor of carrying Jonathan’s stone on our hike today. We got to read all about this hero. It is an honor knowing we for to carry his stone up the mountain. “Today I was lucky enough to hike with Nicholas. Reading his biography was very inspiring to me. He died so young but so bravely. He is kind and honest. His fellow soldiers were so lucky to be with him. When I grow up I want to join the Army just like him. One day I hope people remember me like that. On Saturday October 1st 2016 I had the honor of carrying the hero stone of SGT Nicholas A. Robertson of the United States Army. When I was first introduced to The Summit Project, friends of mine told me a bit about it. Upon doing my own research I knew it was something I needed to be apart of. I never knew Nick. Didn’t get the pleasure of meeting any of his family. Just read his hero BIO,and whatever else I could find. He was only 2 months older then me, that part really hit me. So young. Like a lot of the heroes we honor. I was camping at Smugglers Den for the weekend, so I had a chance Friday to finally “meet” my hero. Going into the tent was a very humbling experience. So peaceful and quite at the time I went in. Walked over to the table where all the heroes were and picked up Nicks stone. It was a good weight. Not to heavy not to light. His parents picked it up for Mt. Desert which wasn’t far from us then. Ran my hand across the engraving, and said hello for the first time to Nick. At that point in time my eyes teared up. Thinking about what I had read about Nick. A completely selfless man who gave his life cause one of his buddies wasn’t feeling good that night, and he volunteered to go out for him. And never came back. Standing there in the tent I thought about all I had read and researched about him. Came back to how his father said every time he deployed and came back he stood a little straiter, little more confident. I knew at that moment I knew I had made the right decision to hike with Nicks stone. The day of the hike I was so nervous!! All I kept thinking was, what if I can’t do this? But, as soon as I thought that, I had another voice telling me that I could. I believe Nick was giving me that push. We got dropped off and started the hike. And not very long into it my leg locked up and I had to rest. I was sad, mad, and sick to my stomach all at the same time. How! After everything I had done in preparation for this. How was this going to happen now! It was like a bad dream. I was not quitting! Was not giving up! This whole mission wasn’t about me, it is about our heroes. Do it for the heroes!! (Kept screaming in my head.) 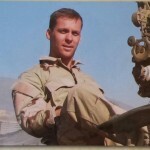 I was able to regroup and keep going, I kept thinking about how Nick had never given up on anything he did in the Army. And I wasn’t going to give up either! He was pushing me, all the way to the summit of Cadillac Mountain that day. At one point in time, one of my teammates asked if I wanted him to take my pack. I looked at him and said, the only time this pack with Nicks stone is coming off me, is when we are at the summit! Looking back today on that whole day, it was amazing!! I knew that Nick had climbed rocks around the area and every time I would look at a rock face I wondered if he ever climbed it. He had hoped to come back when he was done with his last deployment to climb more. Well I think of it as he did. That day. Through me. I couldn’t have done it without him on my back. I truly believe that. I am so honored to have carried his stone and the memories that day. Like I said before. I never knew him, never met any of his family. But that day he was with me. All the way to the summit! I will never forget that day for the rest of my life! To Mr. and Mrs. Robertson, Thank you very much for Nick, for bringing him into this world. He was truly a great human being, and will be missed by everyone’s lives he touched. He may be gone. But I will never forget his journey to keep us safe. I am writing this note on behalf of my 8 year old daughter, Isabel LoSacco, who had the honor and privilege of carrying the stone and story of Nicholas to the summit of Cadillac Mountain at the last TSP Acadia event on October 14. While my 14 year old son and I have participated in 2 prior TSP events, this has been my daughter’s first experience being as a TSP hiker. I had no doubt that she’d master whatever trail we’d be assigned to as she has been hiking with us since she was 3 years old. I wasn’t sure, however how she’d do with her research about the stone she would have the honor to carry, but my doubts were unfounded. As soon as she got Nicholas’ stone assigned to her she started reading up on him on the TSP website and other online sources. She loves making her own books and that is what she did with the notes she took about Nicholas and his life. 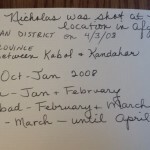 She cut papers, stapled them together until she had a little 3″x 5″ notebook that she used to capture important moments from Nicholas’ life. Moments, such as Nick’s love of performing in the high school jazz band, his love of rock climbing, his special bond with his mom, his dedication to his country and his achievements in his military career. Izzy wrote her notes and illustrated every page with drawings of tanks and music notes, mountains and American flags and it was heartwarming to see just how much effort she put into preparing for her mission. As the day of the hike approached, we set out with our team, Team Bubble, who had been assigned the most technical and challenging route to the summit of Cadillac Mountain, where we were to first summit Pemetic Mountain, make our descent to Bubble Pond, before ascending to Cadillac. From the minute we set foot on the trail it was a scramble over boulders and up cliffs taller than a grown person, but just as the little mountain goat I knew her to be, Izzy took every step of the way in stride, Nicholas’ stone securely tucked away in her pink John Deer backpack. As it is with every TSP hike, there were moments of laughter and there were tears, there were stories shared and friendships forged or renewed and it was great to share these moments with the young hikers on our team, who will carry on the stories of Maine’s fallen heroes well into the future. When we reached the summit, Izzy’s shyness won out and it was too overwhelming for her to share Nicholas’ story in front of everyone, but luckily, I had her detailed notes and illustrations to step up and fill in for her. As I was reading her notes, looking at the pictures she drew, Nicholas’ story unfolded before my eyes and it was my honor to share it with the rest of our team! I am so glad my children got the opportunity to learn first hand that freedom is not free! It is so important to ensure that the future generation learns the stories of our fallen and to make sure that their ultimate sacrifice will never be forgotten! I want to thank the family of Army SGT Nicholas Robertson for entrusting my little 8 year old with their loved one’s stone and story and want to assure them that his story has been passed on to the next generation! September 29, 2018 I had the honor of carrying Nick’s stone up Cadillac Mountin in the beautiful Acadia National Park. Knowing Nick’s love for climbing and that the beautiful stone had been harvested from the very island I was hiking on gave me such peace the minute I first laid my hands on the stone and as I made the way to the summit via the South Ridge Trail. The day was simply perfect. The weather was amazing as we gathered under the tent in preparation for this amazing event. I proudly took possession of Nick’s stone, tracing the engraving with my fingers and smiling as I had finally been able to make the physical connection with my hero. I had done hours of research, spoken with his younger brother, and patiently waited for weeks to finally get my hands on this stone to physically feel his presence that had existed only in my heart so far. I tucked him safely in my pack and silently promised him a beautiful hike to the summit. The hike was spectacular. The sun was out, the temperature was perfect for hiking, the views along the way were breathtaking. Every step of the way I felt the physical weight of the stone, but more so I felt Nick’s presence with me as I took each step. No doubt he was smiling down on me and my wonderful team as we made our way up the trail. The summit and our circle was nothing short of magical. Our team did such an amazing job honoring the men and women we carried. When it was my turn to speak about Nick I pulled out a wrinkled piece of yellow paper that was covered in quickly taken notes. I had tried for days to write something formal to read at the top so that I could make sure I did Nick justice but every time I simply couldn’t put words to paper. So there I sat with the crazy notes I had taken the night I was able to talk with Todd. I had hid in the bathroom as my two kiddos were wild and I wanted to hear every single word Todd had to share with me about his brother. The paper had things on it like scholar, philanthropy, top not student, humanity, dedicated, no one left behind. I did my very best that afternoon to tell the 18 other people in my group what an amazing man Nick was, fighting and eventually letting the tears flow for the loss of a man this world was blessed to have for such a short but impactful time. I quite frankly feel I will never be able to truly do Nick justice. However, I can honestly say that he will forever be part of me and I will use every chance I get to tell his story so that his memory is kept alive for many years to come. Hello, my name is Teresa and I work for an agency called Penquis in Bangor Maine. We have been lucky enough to have the honor case on display in the lobby. I have to say, I have never heard of the Summit Project prior to the case coming here, but what a wonderful project! I had the honor of choosing your son Nicholas as my Valentine today, to learn about his life and his story. He must have brought you so much joy! He sounds like a wonderful man, soldier, and son! I got emotional when I read that he chose to take another soldier’s place that fateful day. As a mom, that breaks my heart, but what a commendable thing to do! I hope his story lives on through the summit project for many more years, because everyone should hear what a wonderful man Nicholas was!